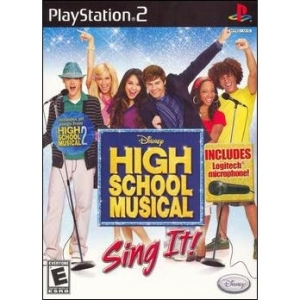 ValleySeek.com: Disney Interactive 7013701 Disney Interactive High School Musical: Sing It! Disney Interactive High School Musical: Sing It! You love the movie. You know the songs. Now you can grab the mic and experience Disney High School Musical in a whole new way with High School Musical: Sing it! In this original karaoke video game, choose any High School Musical star and get ready to perform all your favorite songs from High School Musical and High School Musical 2! You can sing your way through the story of the original movie. Sing solo or pair up with a friend and sing a duet. The better you perform, the more you'll unlock - from amazing special effects to sensational costumes. With High School Musical: Sing II!, you'll enjoy endless hours of song and performance fun! Sing all of the songs from BOTH High School Musical and High School Musical 2, plus other bonus songs from popular Disney Channel artists. 30 songs total! Play as Troy. Gabriella. Taylor, Chad. Ryan and Sharpay or create a new character based on your own unique star style. Software Name: High School Musical: Sing It!